MotoGP world championship leader Casey Stoner reckons defeating title rival Valentino Rossi is a privilege as he looks to extend his series lead over the Italian in the Czech Republic next weekend. Casey Stoner has won six out of 11 races in 2007 to open up a commanding 44-point lead over Valentino Rossi, with a win record 50 per cent better than the Fiat Yamaha rider. Casey Stoner said he expected another backlash from seven-times world champion Valentino Rossi when the pair renew their 2007 title scrap in Brno on August 19. Valentino Rossi produced a brilliant burst of form from Brno onwards 12 months ago to overturn a huge points lead held by Repsol Honda rider Nicky Hayden. And trailing Ducati's Casey Stoner by a massive 44-points he needs to reproduce that kind of form again. Casey Stoner admitted that the dynamics of his relationship with Valentino Rossi were inevitably changing now the duo are becoming world title rivals. But he said their relationship would never deteriorate to level of animosity of previous rivalries that Rossi had with Max Biaggi and Sete Gibernau. 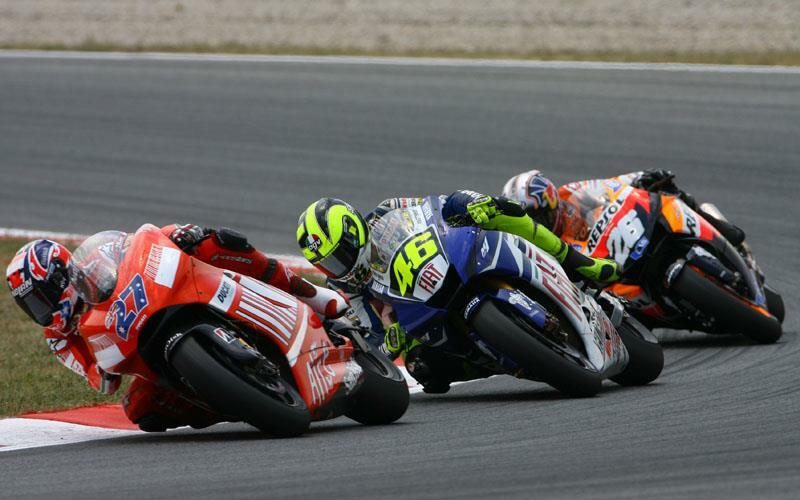 “For sure Valentino is not quite so friendly as in the past because when I was in 250s I wasn’t a threat. Now we are competitors so it changes a little but I have no problem at all to speak with Valentino and he is always very nice to me, as he is to everyone, except maybe for one or two riders. “He’s easy to get along with. We normally never talk about bikes, just other stuff, Valentino’s a pretty easy guy to talk to,” added Stoner, who recently signed a new Ducati deal that will keep with him the Bologna factory until at least the end of the 2009 world championship.